You’ve probably already seen this gag — other people I showed it to this morning had — but for those who missed it, here’s a funny for you. And no, it’s not supposed to be serious commentary or anything; it’s just a funny picture that was suggested by Trump’s body language in the photo, combined with Angela Merkel’s expression, which looks like a teacher addressing a wayward pupil. So lighten up, Francis. This entry was posted in Donald Trump, Humor, It's a joke!, Social media on March 20, 2017 by Brad Warthen. One of my favorite things about the Internet is the crowd-sourced comedy, especially when something silly starts trending on Twitter. Not as funny as the Quinn parody. Yeah… but you know, ever since the first one of those I saw — the one about Star Trek, which Burl brought to my attention in 2009 — those “Downfall” parodies have gotten less and less funny. That video was hilarious… because it captures the underlying truth so well. 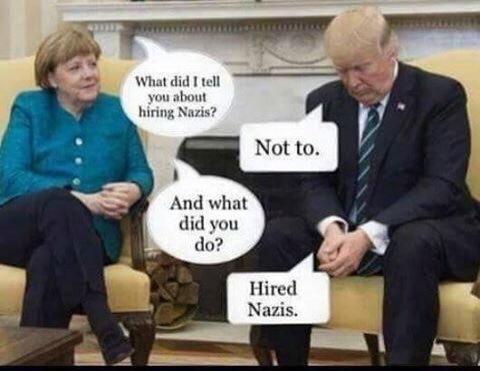 When did Trump hire Nazi’s? If never, I don’t get the joke. She’s German, you see. You take that and combine it with Trump’s fascist tendencies (authoritarianism, ethnic nationalism, personality cult, etc. ), and you have a joke. Okay… I still don’t get it. Maybe if they did it as a knock-knock joke. They’re smart enough not to declare openly that they’re Nazi-ish.